In 2014, the number of mobile users exceeded desktop users, and it continues to grow every year. Therefore, mobile advertising is vital to any business or brand. 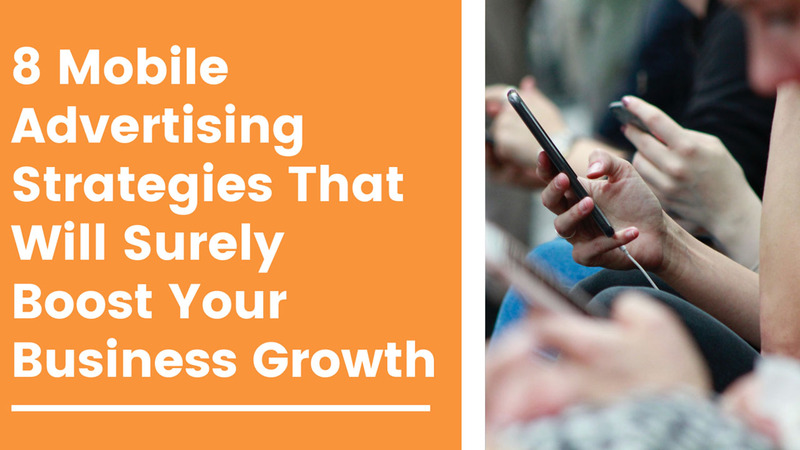 Without a proper mobile advertising strategy at hand, how do you know that your mobile ad campaign is successful in creating brand awareness and generating sales? The most significant part of the mobile ad market is Search Ads. Google AdWords gives different services for mobile advertising. Aside from that, these are usually text ads, so you don’t need to come up with an ad banner to get started. You can create an AdWords campaign that’s mobile-specific. Meaning, it only explicitly targets mobile devices with full web browsers. You can also create AdWords bids specifically for mobile searches. Moreover, it’s possible for you to control the costs by setting a maximum daily spend. Afterward, you can track your AdWords mobile performance so that you can focus on improving your conversion rates. Even if your current site is mobile-friendly, it’s possible that it’s might not be the most effective destination for your mobile ad. That’s precisely why you need an efficient landing page that’s designed to turn those mobile visitors ultimately into paying customers. Your mobile landing page should link directly to your main website. What’s even more important is that it should indicate your address on the map, your opening hours, store number, and the location you serve. You can setup your site with other features as well, like fast help support and an online appointment scheduling system that’s related to the pitch you created in your ad. So, if you can create a mobile landing page on your current website platform, then excellent. If you haven’t, then a mobile landing page doesn’t need to be included in your main site. For your online advertising strategy, behavioral targeting and personalized ad content are vital as it can help you boost your mobile conversions. Also, no matter what platform you’re using for advertising, a majority of users won’t put up with irrelevant ads. Take the time to think about your target customers. Who are they? How often do they use their smartphones, and how regularly do they consume mobile content? That’s where dynamic creative optimization technology (DCO) comes in. Through this technology, you can better customize your ads so that you can know your target audience just a little bit better. For prospects to call you, you have to minimize the barriers. Instead of showing a typical headline when showing your ad, directly take users to your landing page, and include your business phone number on the ad. Doing so will help reduce the barrier between you and your prospects. Usually, if users want to get information quickly from your business, a phone call is required. Ads tend to be annoying especially if it interrupts a user’s attention. Added to the fact that it’s a slow-loading ad, and users are going to have a negative experience with your brand. What’s even more shocking is that according to a study, approximately 44 percent are using ad blockers because of ads with slow loading times, which ultimately affects their user experience. Don’t place a hosted video content or too many images on the ad. For the best user experience, make sure that all of the ad elements are compressed under 1000 bytes. Make sure those ads are under a majority of apps and publisher websites. See that you have a ‘polite load’ support. It ensures that the lighter file is loaded as the content page loads. Don’t use flash and other incompatible technologies for serving. People will always love free stuff. That’s why, exclusive deals, special offers, and promotions are potent tools in letting your mobile audience act on your ads. But keep in mind that although incentives are great for advertising, it becomes harder to stand out in an overcrowded ad market. People aren’t taking immediate action. At times, there are too many steps involved in the offer such as redirections and email confirmations that they lose the buyer along the way, even before claiming the offer. So for your ad to be effective, you have to make the entire process easy for your customers. Don’t just sit there and wait for your ads and post to garner clicks. Instead, you have to focus on reaching out to your target customers and building a solid relationship with them on social media. If you can’t afford a social media manager at this point, you can always ask members of your team to “like” posts and leave relevant comments on social media. Think about it, every comment or like functions as a hyperlink to your social media profile. Your efforts can be further boosted if you spend money on ads on Facebook, Instagram, or Twitter. In-App Ads are rapidly growing in popularity mainly because of the shift in consumer behavior. More and more tablet and mobile users are turning to apps first when they’re opening their devices. However, it doesn’t mean that you should completely ignore mobile web advertising. It merely suggests that you should also put a fair budget on spending on in-app media. So, there you have it. Keep in mind that these strategies will work best if used together. While it may take an inordinate amount of time and effort to implement at first, just be persistent in your efforts, and you will see significant results in the long run. Bryan Mixon is the owner of AmazeLaw.com, the website building for solo and small firm attorneys and also known as one of the best mobile advertising agencies. He has been building websites since 1999 and has spent his last four years helping companies like HubSpot, Mill33, and LivingSocial. Bryan knows from his personal experience how difficult it can be for small business owners to get their digital marketing off the ground, so he built AmazeLaw as a great super-simple place for solo attorneys to build their sites, collect leads and get on with their days of doing lawyerly things.